Hello and welcome to the first Destination Inspiration for September. Jennie here with you today with a whole new set of items in the travel bag. Here in the north Autumn has very much set in and yet there is so much green around in the leaves on both the trees and the flowers. 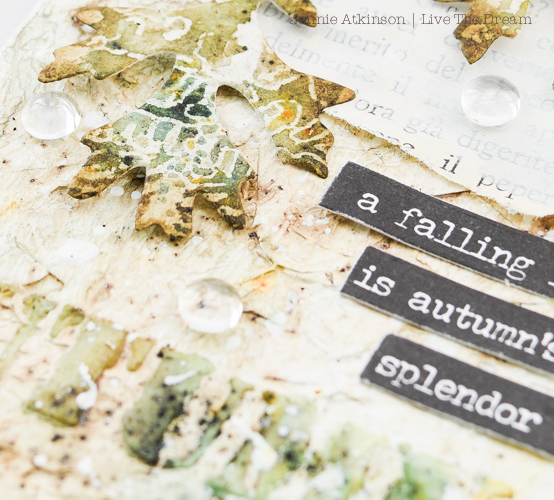 So with this in mind I decided to create an "autumn falling leaves" board but with green leaves. I started with a chipboard base and used some old dressmaking patterns and loads of multi medium to create a textured background. 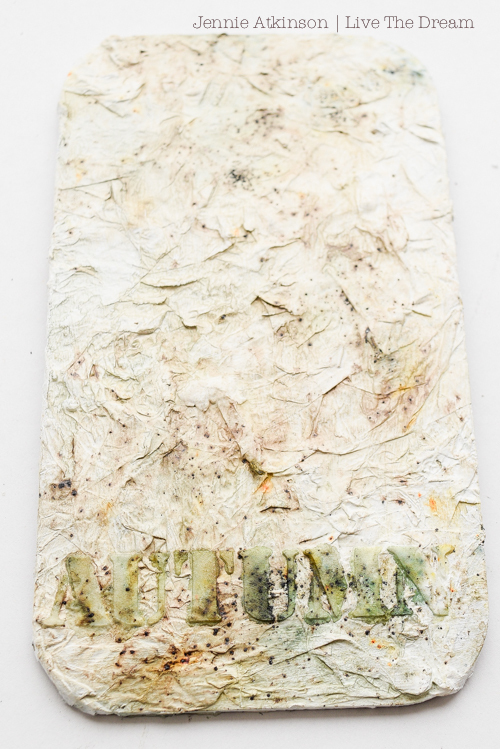 I then applied three coats of Gesso and a little more texture along the bottom using a much loved stencil. 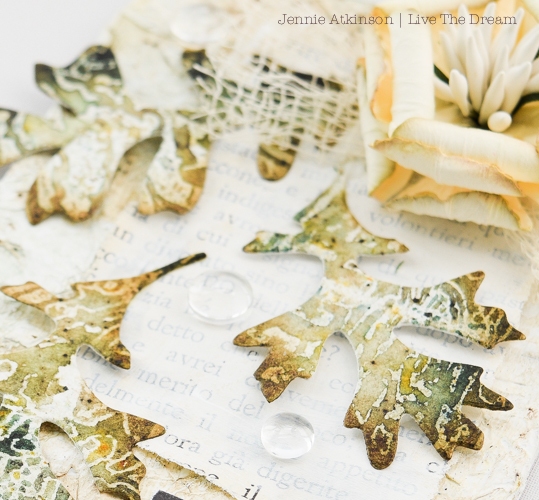 I then spritzed the whole lot with PaperArtsy Olive Tree Infusions and used loads of water to get this lighter effect. I love how there are tiny little flecks of orange in there too, so not all green! Three of my travel bag items used at this stage. Turning to resist techniques was my next step as I wanted to do something a little different. I have seen wax resist/faux batik techniques on Pinterest but have never tried it. I spent some time watching many videos. It was all fascinating but in the end I had to just get stuck in and have a go. There are no pictures of the process as it all happens rather quickly! You can't see much on the tags at this stage but when inked, or in this case spritzed with the Olive Tree Infusions beautiful batik style patterns emerge on the paper. 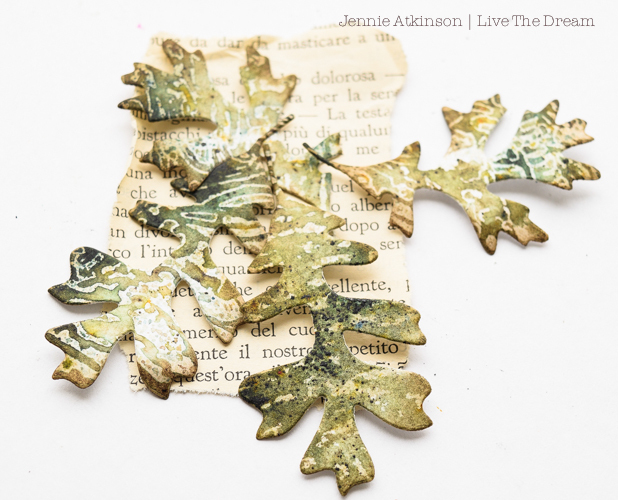 I die cut my leaves from the tags (using Tim Holtz's Tattered Leaves die) and then added Gathered Twigs Distress Ink around the edges to give them a little definition. Then it was down to adding them to the background. This lovely quote seemed most appropriate. And finally as I still have a few tough daisies left in the garden borders I decided to finish off with an Autumn flower. Unfortunately since I made this little project we have had horrendous gales and torrential rain, so the falling leaves are not really falling but going in a rather horizontal direction past the house! Thank you for stopping by for this short tutorial today. Do please pop back next Monday when another Creative Guide will be taking your through their use of the travel bag contents. 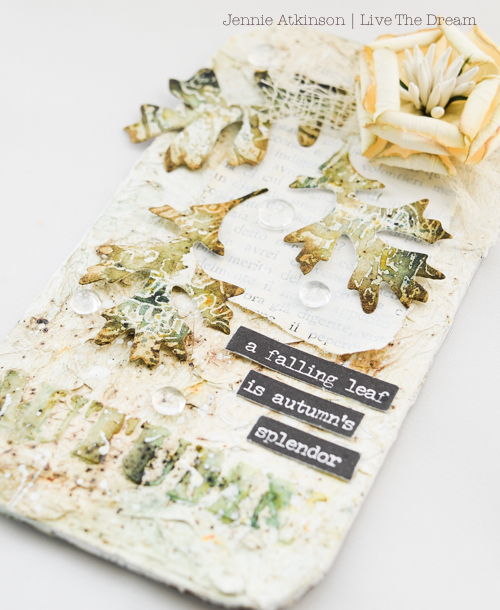 And of course check out our new challenge ALTERED ART and the wonderful pieces made by the Creative Guides. Just lovely, Jennie! I love the wax paper resist technique and you have gotten wonderful results! 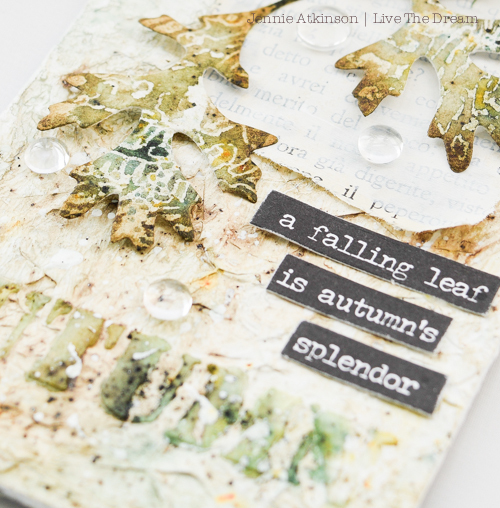 The coloring on this is gorgeous and fits your transition to Autumn theme perfectly. GORGEOUS tag and a fabulous post! Hugs! 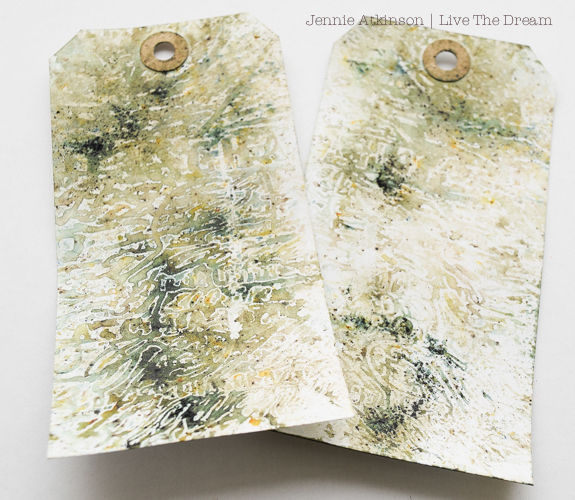 A fabulous DI post using the travel bag contents Jennie x Love the textured details and your resist technique is fabulous...must give it a try. I think your batik leaves are absolutely gorgeous, Jennie, and they look beautiful fluttering down past the fabulous textured background. Delicate, ethereal and so, so pretty. Great DI use of the travel bag contents! Love the colors, technique and the step by step - a delightful, visual image of the season! Absolutely adorable and beautiful! Amazing! Your falling leave panel is Gorgeous! Jennie. 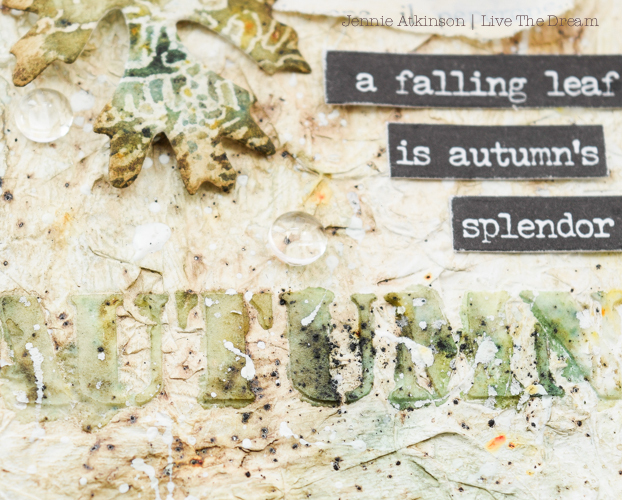 Fabulous textural background with a lovely crisp autumnal feel- the perfect setting for your wonderful 'batik' leaves. Thanks for the memories too - I used to enjoy working with batik back in my college dates. First off your textures are exquisite and the organic-ness of this is stunning! You made Autumn seem less scary to me with this piece- Autumn Splendor at it;s finest! 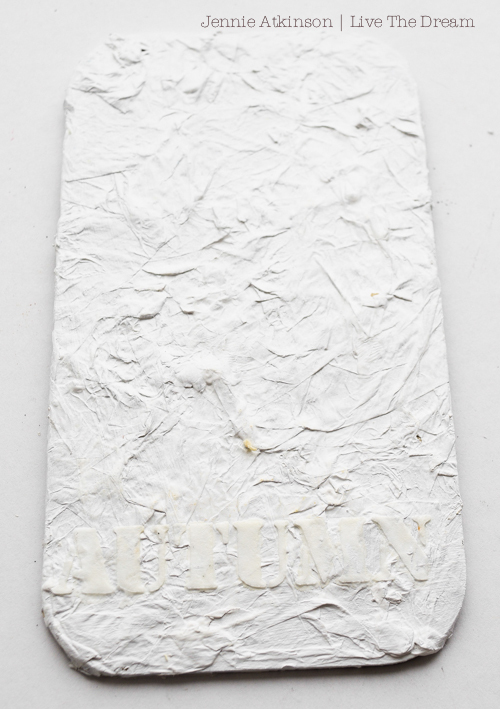 What a neat embossing, resist idea. Thanks for a lot of research on this, then showing us. This is absolutely stunning looking.